Personalized Rubik's Cubes Custom Printed in Bulk. Promotional, Cheap. Lowest prices in USA, Canada. 4 Panel. 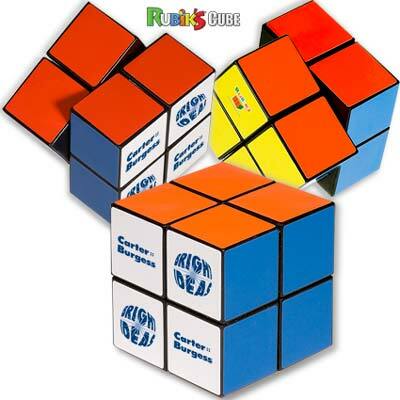 High quality, yet inexpensive 4-Panel Rubik's® Cube in bulk, customized with you logo. We also supply blank (not personalized) 4-Panel Rubik's® Cube for 6.20 each. Free artwork design and Free proofs! American clients pay no taxes. The unit prices below include your 1-color custom imprint on one side. Add $0.55 per cube for each additional imprint color; Add $0.65 per cube for full color imprint. We also supply blank (not personalized) bulk 4-Panel Rubik's Cube for $6.20 each. PRODUCTION TIME: 5 days after art approval; Rush 1 day production is available: contact us. Blank items ship next day. • Comes in the mini size 1-1/2"
• 100% of the plastic used in this product is pre-consumer recycled plastic. Plastic comprises approximately 90% of each piece. Shipping info: 120 pieces per carton, 34.00 lbs per carton, carton size 10.00" x 16.00" x 14.00"